High grade MS-65, Normal over-strike. These new oversrtike coins are talk of the town. More and more people are becoming Daniel Carr collectors. I really believe these American coins are alot more interesting to collect then the tokens,etc. Can't wait to see what is next. This has open up a whole new market to keep our interest in coin collecting. Thanks for your new ideas in the coin world. 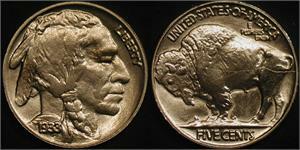 A Brand Spankin' New "Buffalo" Nickel!